Having really enjoyed X-berg, and subsequently signing up for X-pyr, I am really excited about this kind of event and I’ve thought about having something similar on my home turf in New Zealand. Looking at maps and planning possibilities is half the fun of this kind of event. Similar to vol biv but with a few extra rules to define the purpose and make it a competitive challenge. I think the main challenge of organising such an event is being able to assemble willing participants! Even though lightweight gear and vol biv has undergone a surge of popularity in recent years, there’s still only a smattering of people across the world who are actually out there doing stuff at any one time. As such I’ve tried to keep things as simple as possible. Informal rather than a “race” or “competition”. The spirit is to race xalps style but less fuss and everyone is self sufficient and responsible. Organisation will be collaborative, with a guide produced (or facebook group?) to share tips on the route options, essential gear, weather, etc. Ex-lovers is an odd name but it’s based on x-(X) events and Lover’s leap, a steep cliff by Earnslaw station in what I think is the loveliest area of New Zealand if not the world. Suggested for Labour day long weekend, fourth weekend of October 2014. A starting time of Saturday 25 October 2014 at 9am gives ample time to reach a launch for morning thermals while keeping a sense of urgency. Alternative proposed dates are boxing day, and the end of January 2015 to coincide with the NZ paragliding open. This is the tricky one. New Zealand’s mountains can be very remote, lacking European infrastructure. It must be possible to complete the route without bush bashing, bluffs, glaciated terrain or serious river crossings if it is not flyable. It must have plenty of landings available. While a flexible task approach is used in Bornes to Fly, I think a simple set route is more iconic and gives more independence to pilot decision making and less burden and controversy to organisers (if any!). Ideally the set route will be a challenge in good thermic conditions, yet achievable in non-flyable or marginal conditions. It should be simple and aesthetic. I considered circumnavigating Lake Wanaka (very aesthetic but too far to walk) and climbing Mt Earnslaw (too technical, although maybe it’s a good Easter option). I think I’ve found a good balance. The REES DART is the the most popular walking route in the Queenstown / Glenorchy area after the Routeburn track. Four modern huts and a well formed track can be utilised provided the pilot lands on the right (correct!) side of the river. Earnslaw station, at the base of Lover’s leap. The land owners seem keen to support this kind of thing (yet to be contacted), and there are various route options from here. – In a southerly, the cliffs can be soared from low down, then you can continue down the Rees or cross the Earnslaw burn to western faces above the Dart. – In light winds, Lover’s leap can be climbed in a few hours and you can fly into the Rees for morning sun faces which offer great flying. – In unflyable weather, you can walk up the Earnslaw burn track, or follow a 4wd track up the true right (west) side of the Rees valley. – In good thermic conditions, confident pilots may choose to walk up to the Mt Alfred NE facing launch to start. Dart valley catchment, east of Mt Head, west of Mt Clarke. This is about half way along the Rees Dart loop track route. Having just a single turn point objective makes the race simpler and more iconic and gives more freedom to the pilot. The lowest point between these two peaks (Pyramid col) is over 2000 metres, and the southern side is heavily glaciated. It means that in most flying conditions it is very difficult to reach by air without committing to flying into the Dart valley. It thus becomes a challenging obstacle for both good and poor weather conditions. By foot it is possible to climb Mt Clarke from the Rees which is a relatively non technical climb (but maybe not in spring?) but it wouldn’t offer a significant advantage to following the well formed track across Rees saddle and down the Dart. The finish is back at Earnslaw station. While this may involve retracing your steps, I think the nature of the turn point is such that many pilots (slash walkers!) would choose to go up the Rees and down the Dart, or vice versa. Competent paraglider pilots who are comfortable with tramping in the New Zealand back country and are self sufficient. There is also the multi sport option for trail runners or even pack rafters to compete alongside. You tell me. I’d quite like to do something like this on my own but if there’s a crew out to join me it would make it much more fun. 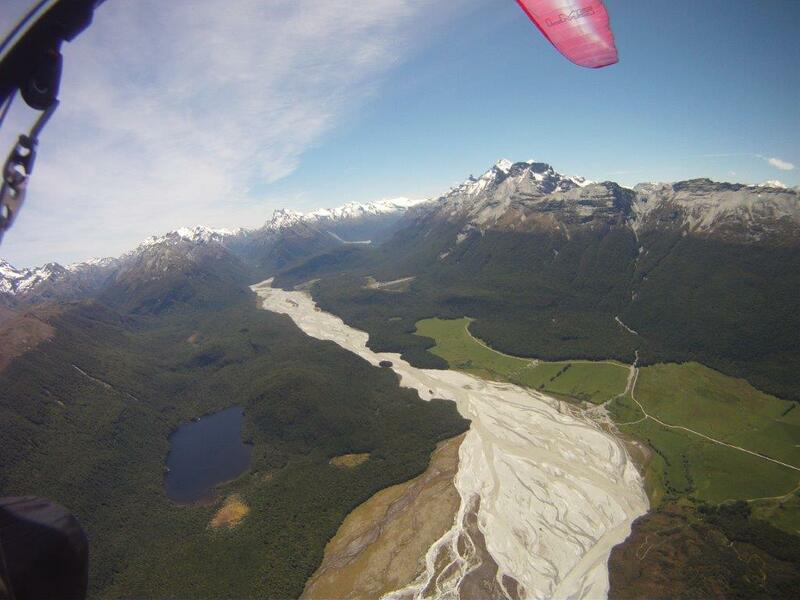 This entry was posted in Uncategorized and tagged adventure, New Zealand, paragliding. Bookmark the permalink. I’m in Nick. Keen to fly through there with you first though!! Cool! I don’t think I’ll be in New Zealand before late October though – even thinking maybe between boxing day and new year might be better. Happy to share my experience though – in fact I’d say there’s more on this site on the Rees Dart than anywhere else! Sounds awesome .i like it . I was thinking diamond lake around mt earnslaw and back to diamond lake anyway you want .if it wasn’t on to fly though wrights col you could top land and hike it or fly up the valley and around.people with super light weight gear ,speed wings could hike to esquilant biv fly down the Bedford and relaunch if they had to. The other thing I was thinking was the acro flyers could have a comp from the leap if it was so arable or mt Alfred over diamond lake. Maybe hang gliders as we’ll? that’s just what I was thinking just idears options to consider or not . It’s going to be awesome! 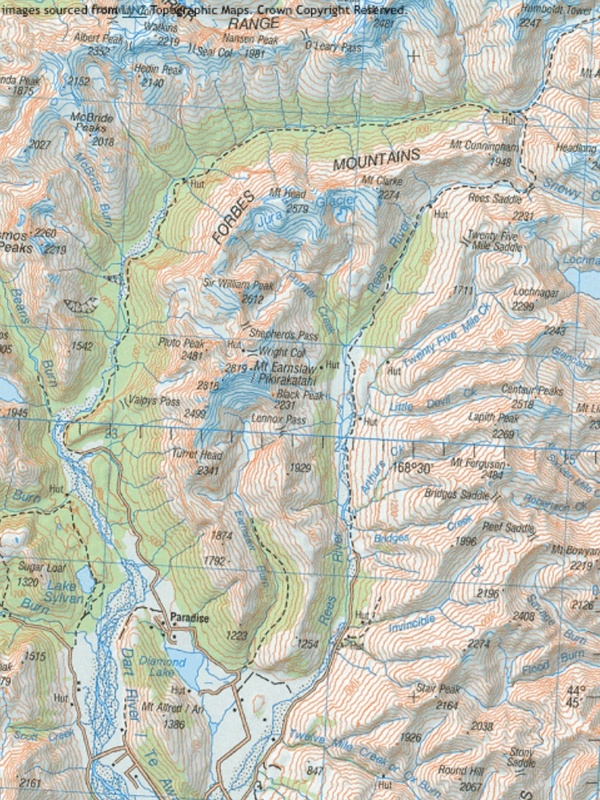 I also like the simplicity of just getting behind earnslaw but the problem is technical terrain – ice axe for east side, most people would want ropes to descend into Bedford (if they even find route), not many route options, bluffs, bush, glacier etc. Weather might be crap remember. Also if it’s flyable earnslaw very easy and it would be a couple hours potentially, not really vol biv!